The College of New Jersey’s new STEM Complex embodies an ambitious new approach to technology education with learning spaces designed to foster collaboration across disciplines. The overarching goal for the redesign of The College of New Jersey’s (TCNJ) science buildings was to create a unified state-of-the-art facility where a high level of productivity and innovation would flourish. The plan was to connect a new STEM Building with the existing Biology Building to form an all-new interdisciplinary STEM Complex that would encompass majors such as Biomedical Engineering, Artificial Intelligence and Robotics. This sophisticated, high-tech environment would attract and retain the best faculty and students and educate students in collaborative spaces likened to real working environments they will encounter after graduation. EYP Architecture & Engineering embarked on a design plan for the 89,000 s.f. STEM Building that removed as many solid walls as possible and incorporated much more glass and public spaces. 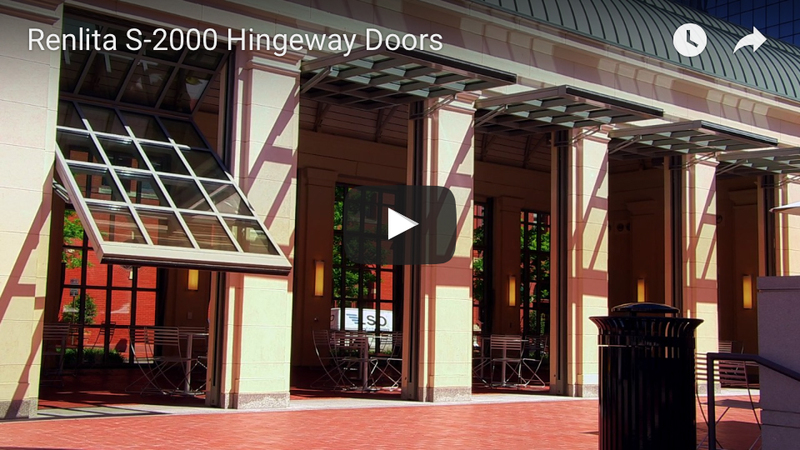 To provide increased space flexibility and openness, the Renlita S-2000 Hingeway door was installed in the building’s centrally located Senior Design Space. The 10 ft. wide x 12 ft. high motorized Renlita vertical glass door provides multiple functional benefits including the inflow of massive amounts of natural light for better visibility and easy egress for moving large projects and equipment into and out of the lab. The Renlita was finished with window mullions that were designed to match the Georgian-style buildings surrounding window details providing an industrial look that fits perfectly with the high-tech aesthetic. Folding along a horizontal hinge, the counterweight balanced S-2000 creates an awning effect when open with minimal internal projection and requires little headroom. The STEM classrooms and labs are now strategically connected by open informal learning areas such as student lounges and common study rooms. The Renlita S-2000 Hingeway glass door fits perfectly into the new design incorporating space flexibility, natural daylighting, openness to the outdoors and contemporary aesthetics. EYP Architecture & Engineering masterfully delivered on TCNJ’s vision of the modern, open campus creating a state-of-the-art STEM Complex that prepares students to become the innovators of tomorrow.